The Cowboy and I came together thanks to dancing. I was getting ready to leave West Texas with one regret: Not having learned the Texas Two-Step. A friend of mine heard my whining and invited me out for a night of dancing with her friends. She assured me there'd be plenty of guys to teach me. Well, the Cowboy was there and he took me for a spin, then another...and I ended up learning the Two-Step, falling in love, and never leaving West Texas. So when friends in the Santa Angela Renaissance Guild asked for volunteer dancers (who could bring their kids to the practices)for the Feast of Santa Angela, a community event, we jumped in with both feet. It's amazing how much flirting goes on in the dances. I guess somethings never change. Needless to say, the Cowboy and I have been diligently learning medieval-era English country dances, such as the Rufty-Tufty. I also ended up writing my weekly column on the Renaissance-style dinner that will be enjoyed at the feast. Sometimes life knows better than I do about what I need. 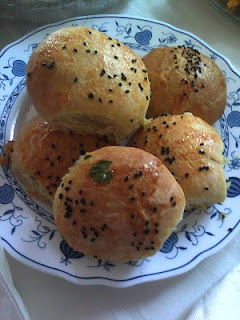 Recently, I came home to a phone message from my Turkish friend, Saleha, inviting me to an afternoon tea the next day. I called her back to decline. I love Saleha and I love her cooking, but I had a hectic weekend scheduled. When Saleha mentioned the tea was at 1 p.m., my food loving self piped up: ha, you’ve to drop the kids off at art class about that time anyway. How often do you get Turkish food? My writing self countered: you’ll actually have some peace and quiet, and you planned to write. How often do you get that chance? So they negotiated down to: just go for a little while. Since the invitation was just for ladies, the Cowboy ended up taking the kids to art class and I went to tea (yes, I brought back goodies for the wonderful man). 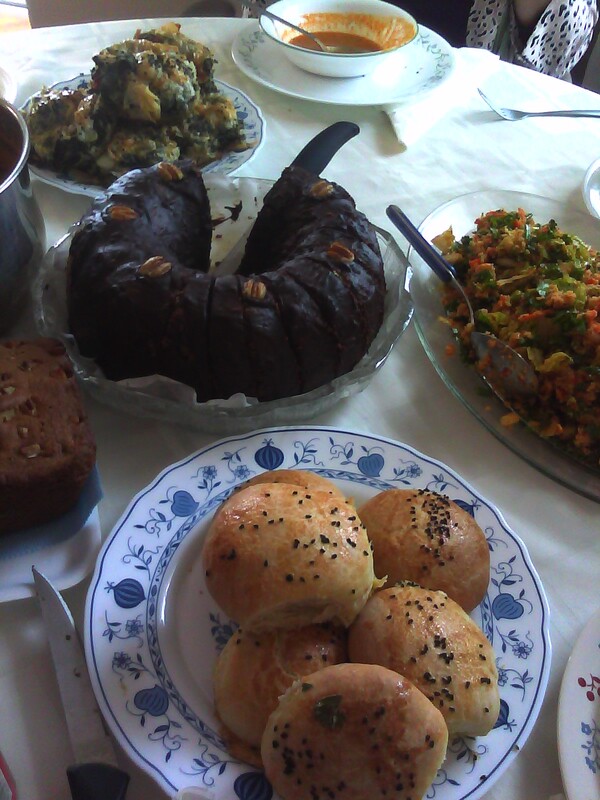 Saleha had prepared a feast: a red lentil soup, bulgur salad, and two different types of breads. One lady had brought a chocolate-covered Hawaiian bread and another had bought carrot cake. And of course there was hot tea, a beautiful, translucent burnished orange tea. Mine came in a traditional short glass with its tiny metal platter and spoon. I added my sugar and stirred, took a sip. One taste of that sweet, warm tea and my entire being relaxed. Now I’d chosen my seat specifically to be able to keep an eye on the clock Saleha had hanging on a wall. But then the eating and talking began. I reached for a perfect round bun, shiny and brown, decorated with a sprinkle of black nigella seeds. I bit into the soft, buttery bread and discovered a delicious surprise: cheese and parsley hidden deep in the heart. The Turkish pogca (pronounced poh-cha) is a perfect treat. Saleha shared the good news of her son’s engagement. Hearty congratulations rang out and more tea was sipped. We teased her about how worried she’d been about finding someone to take care of her son. We talked about our respective countries – Turkey, Jerusalem, Bangladesh, commiserated over bad politics and the expense of air travel. We spoke of our new year celebrations. A friend spoke of her disappointment when ill health kept one of her children from travelling, but her other children rallied the family and off they escaped to the serenity of Big Bend. They hiked, they laughed, they celebrated family. Somehow talk turned to fears. One lady treated herself to a spiritual retreat to celebrate the new year and drove to a hill country resort all by herself, terrified that she’d get lost. Well, she made it there and back. We told her, “You did it” and drank more tea. My friend, Ara, told us about jumping off a cliff to paraglide. I think all the eyebrows around the table jumped to the ceiling and back. Why, we asked her. I shared my fear of heights and a story about a terrifying car trip to Aspen, where we had to travel a narrow and steep winding mountain road with no protective barriers. And Ara said, “But you’re a journalist and you’ve done so much.” Yes, but I’m also human. And part of being human is being afraid. What we are afraid of is as different as the different shades of human skin –some could be afraid of something as small as a common spider or something as big as death. Do we let fear stop us, or change our course? Do we face it down and work through it? Or do we thumb our noses at our fears and become daredevils? How each of us deals with our fears is what defines us. Of course, talk turned to tea. The process of tea making, the different types of teas, the use of loose-leaf teas vs. tea bags. I’ve since learned that green tea, oolong and black tea are different classifications determined by how the leaves are processed. However, there are many sub-species of the tea plant and white tea is produced from the mature buds of a rare tea bush found in China. Saleha shared that in Turkey women often come together for tea parties and wished her friends in San Angelo could visit more often. Her words reminded my childhood home in Bangladesh. Tea was served at least twice– at breakfast and at tea time (4 p.m. precisely). Tea was made whenever guests dropped in, whatever the time. The Bengali’s tea-drinking habit is one of the few positive leftover legacies of British colonialism and we brew it strong and take it with milk and sugar. With garam cha (hot tea), there had to be some nashta (nibbles) and, of course, adda –a discussion that covered any and every topic under the sun. So an impromptu invitation to tea by my Turkish-American friend took me half-way across the world and back in time when life was as sweet and nourishing as a cup of hot tea. I left Saleha’s house hours later than I’d intended but full of stories, full of good food and full of happiness. On the drive back, I made myself a promise: I must have more tea parties. Whenever my mother heard any of us sniffle or cough, she’d rush into the kitchen and brew us some ginger tea to sooth the throat and chase off the cold. As a child, I thought it vile. But as I grew up, I grew to enjoy it. Now I make it if either Alvin or I are feeling under the weather or just to warm us up on a cold, gray day. Place water and ginger in a small non-reactive sauce pan and bring to a boil, lower heat and simmer for about 2 to 5 minutes. Take off heat and add tea leaves and brew to desired strength (I prefer a bright rich color). Using a strainer, pour into a cup. Add in sugar and a squeeze of lemon (if using), stir and serve. My this week's Family Table column is a reflection about surviving a minor crisis and surviving it well. The breakdown of the refrigerator helped me put panic in its place, move my family toward a healthier life, and to Meatless Monday. Better outcomes than I expected at the beginning of the experience. Life's funny like that. If you read the post, leave me a note and share what you think. I just signed up for the Ruby-Slippered Sisterhood's Winter Writing Festival that starts tomorrow. For example I have committed to: Writing a new scene OR Revising 2 pages per day to earn my points because I am in midst of writing a new book and revising a short story. I want both those projects done and I'm hoping the festival will motivate me closer to the end. My parents always threw a New Year’s Eve bash. The furniture would be removed, music and drinks would flow, and tables would totter under the weight of food. Yes, my parents liked a good time, and yes this party was to celebrate their wedding anniversary (December 30) as well as the new year. What was not commonly known was there was also another, more superstitious reason. The first day of a new year isn’t just another day for most people. It’s weighed down with significance and superstition. What you do in the beginning sets the tone for the entire year, determines the course. My mother, a steadfast believer of this, refused to spend money or cook on the first day of the year. So she was always made sure to have plenty of leftovers for January 1. When I married the Cowboy and got initiated into Texan ways, I learned the importance of black-eyed peas. He insisted on eating them on January 1 to insure good luck and prosperity for the rest of the year. For this tall, dark and practical man of few words to admit to a superstition simply endeared him to me. Made me smile and give him a big hug (yes, it’s got to be love), then cook him those beans. Unlike a lot of people, I don’t consider cooking a chore. There is a certain kind of peace in chopping and mincing, measuring and mixing. The heady scent of garlic, onion, ginger or the softer scents of cinnamon or vanilla are like aroma therapy. So come January 1, I insist on cooking dinner together (hey, with a superstitious mom and hubby, some of it had to rub off on me). My 2011 mantra is: Live creatively, consciously, healthfully and simply. And black-eyed peas, an excellent source of Calcium, Folate and Vitamin A, dovetailed beautifully with that philosophy. I’ve been hearing about the Meatless Monday movement for a while and this year I want to make it a part of my life. The goal is to reduce meat consumption by 15 percent for better health for yourself and the planet. The strategy is simple: Go Meatless once a week. Now I understand the organizers’ reasons for choosing Mondays –Monday is the beginning of the week and helps set the intentions for the rest of the week (again, the importance of the 1st day). Also, Meatless Monday sounds a whole lot more poetic than Meatless ANYOTHERDAY. I tried them all out. I love the idea, but couldn’t commit to Monday. Part of living consciously is to pay attention to your body and emotions. So if I happen to crave steak on a Monday, I’m going to let myself enjoy steak that day. Instead, for me, Meatless One Day works better. 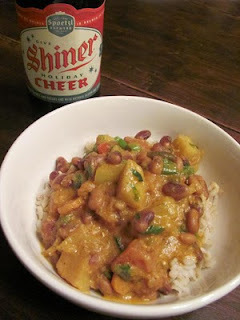 So for our first dinner of the year, on January 1, Saturday, the Cowboy & I enjoyed black-eyed peas cooked in a curried yogurt sauce served over brown rice and accompanied by a beer. Okay, so the beer didn’t quite fit the healthy part, but it was Shiner Cheer, an enjoyable nod to end of the holidays. 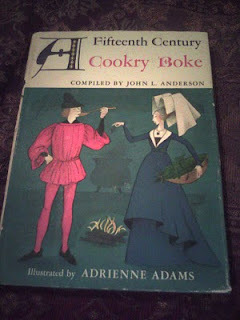 Continuing the pattern of firsts, this seemed to be perfect for my first 2011 #LetsLunch post. So, what was your first dinner of the year? 3. Add the jalapeno, onion, garlic and ginger and cook until the onion has softened. 4. Toss in the spices and tomatoes and cook for about 5 minutes. 5. Add the bell peppers and black-eyed peas, cook for another 5 minutes. Add the water, bring to a boil and simmer for about 15 minutes (the potato should be done). Turn off the heat. 6. 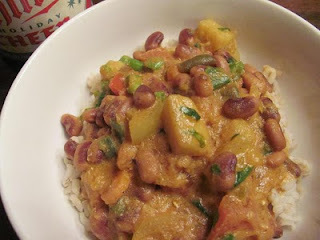 Temper the yogurt with some of the cooked peas, then fold in the yogurt mixture into the rest of the curry. Stir and sprinkle with cilantro. If you'd like to join Let's Lunch, go to Twitter and post a message with the hashtag #Letslunch -- or, post a comment below. Wishing everyone a happy, healthy and happening New Year! Live creatively, consciously, healthfully and simply.